South West Planning authority regions - Tom Spriggs Architect "
Planning applications are made to your local council, who are responsible for all the applications within their area. They follow national guidance covered by the National Planning Policy Framework, or NPPF but all have more local distinctiveness criteria, preferences, and regional requirements. Tom Spriggs Architect Limited is based in Exeter where projects are covered by Exeter City Council, however this is surrounded by several more rural regions with different demands. To the north of Exeter, Mid Devon, East Devon and Teignbridge all meet at a point, which can mean your neighbours are covered by a different authority. Exceptions to these areas is that planning applications made within the National Parks boundaries are dealt with by the National Park Authority. Naturally they tend to be more prescriptive and often have limiting design guidance, which can make some applications more difficult to succeed. 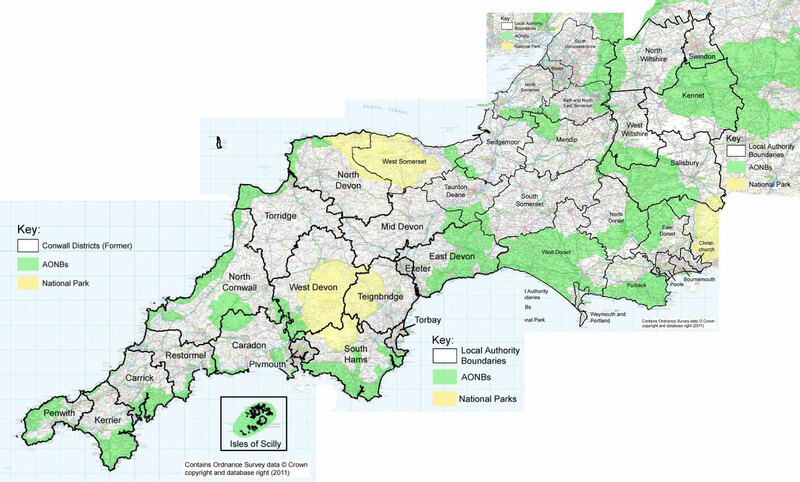 Since this map was made, Cornwall has become a single unitary authority, meaning the sub districts of N. Cornwall, Caradon, Restormel, Carrick, Kerrier and Penwith don’t deal with planning applications separately.